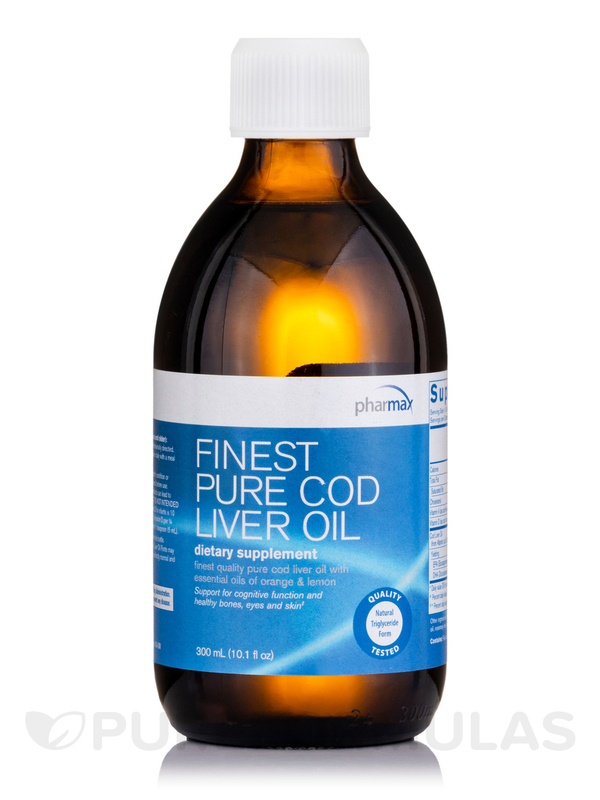 Finest Pure Cod Liver Oil by Pharmax is easy to take and tastes good! Finest Pure Cod Liver Oil is a great tasting cod liver oil I take two teaspoons every morning. Great product!!! Its hard to be completely overjoyed about taking fish oil except for the health benefits but Finest Pure Cod Liver Oil by Pharmax has a pleasant enough taste to get you through. Good health is marked by a healthy cardiovascular system‚ flexible joints‚ a protective nervous system‚ effective digestive tract‚ smooth skin‚ and strong bones and teeth. 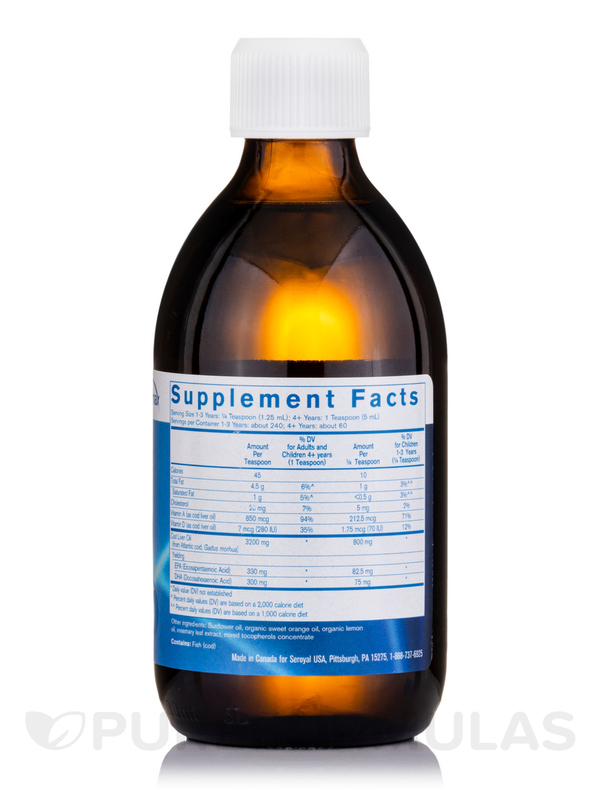 You can help boost your health by taking cod liver oil supplements. Cod liver oil is obtained from the cod fish right after harvest. It has long been a popular supplement for supporting healthy cholesterol and blood sugar levels‚ lessening depression‚ treating middle ear infections‚ and relieving stiffness and pain in joints. The oil has elements in it that prevent your blood from clotting too easily‚ making it ideal for many patients with heart problems. It also has pain-relieving effects and may reduce swelling. Unfortunately‚ your body doesn’t naturally produce the compounds in cod liver oil. This is why taking a supplement like Pharmax’s Finest Pure Cod Liver Oil is essential. It’s better to prevent illnesses through a healthy lifestyle than it is to treat health conditions after they have developed‚ but even the best laid plans can go awry. Finest Pure Cod Liver Oil offers some insurance to help you stay healthy‚ in combination with a nutritious diet and regular exercise. 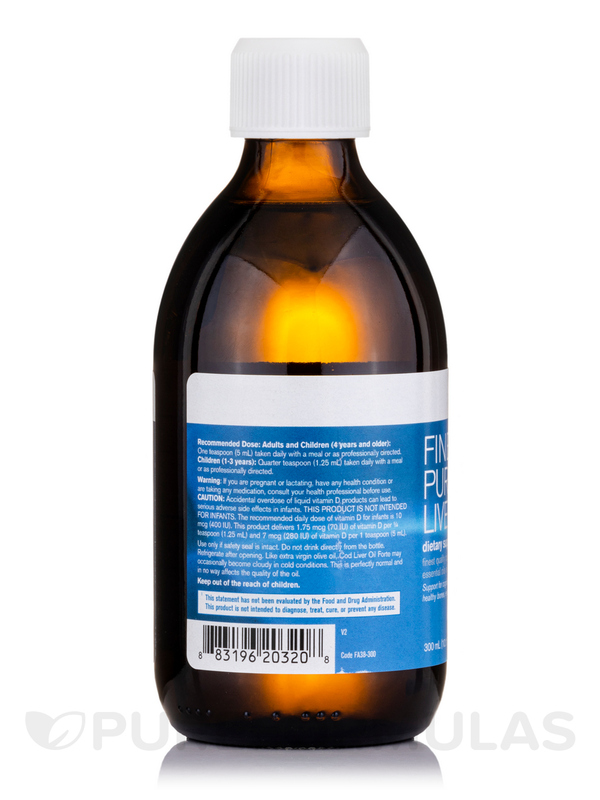 This 300 ml bottle of Finest Pure Cod Liver Oil provides up to 60 servings‚ if taken at the recommended dosage of 5ml per serving. Other Ingredients: Essential oils of orange and lemon‚ natural mixed tocopherols. Independently tested for PCBs‚ dioxins and furans‚ PAHs and the absence of detectable levels of mercury and other heavy metals. 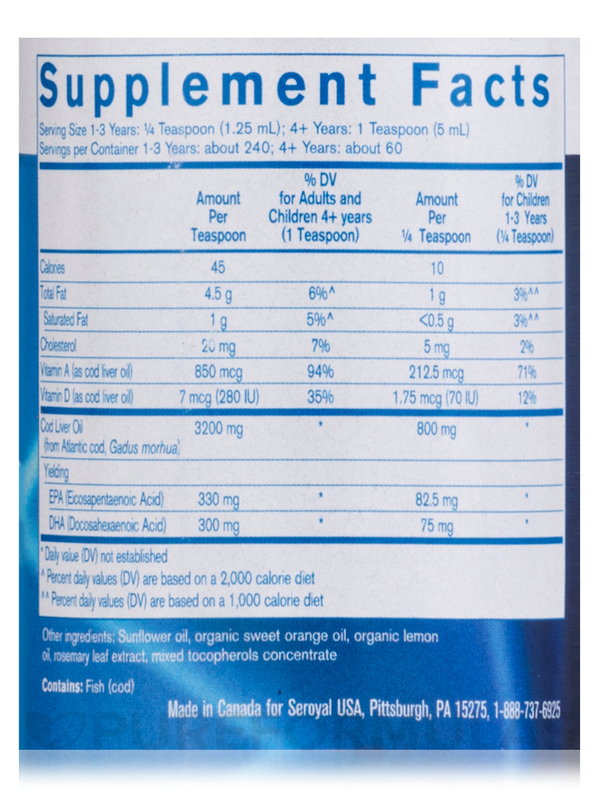 Adults‚ adolescents and children (4 years and older): One teaspoon (5 ml) taken daily with a meal or as professionally directed. 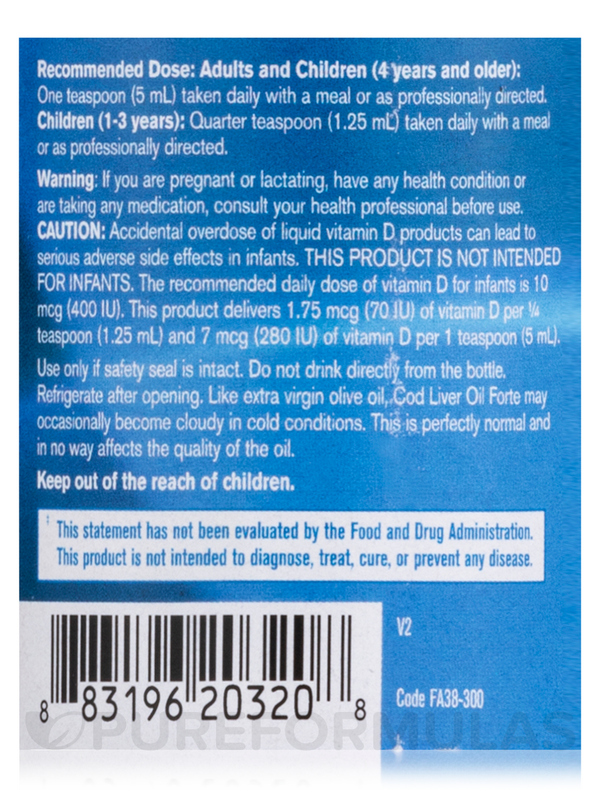 Children (1-3 years): Half teaspoon (2.5 ml) taken daily with a meal or as professionally directed. Vacuum-sealed for your protection and for product freshness. Do not use if outer seal is missing or broken. Refrigerate after opening. Keep out of reach of children. Note: Like extra virgin olive oil‚ Finest Pure Cod Liver Oil may occasionally become cloudy in cold conditions. This is perfectly normal and in no way affects the quality of the oil. I like the quality of the Cod Liver oil. My homeopathic doctor prescribed this for me as some of by blood test numbers were not good. This is so easy to take no fishy flavor at all just a light citrus. Does not come back on you or have a lingering flavor or oiliness. Better even than a pill. I have recommended it to several people. Finest Pure Cod Liver Oil has a great taste! Does this product have citrus of any sort in it? It is not listed.